Uni California Chirashi Bowl + Healthy Brown Rice Sushi. Uni Rice Bowl is quite a delicacy, yet it's really easy to make. Just cut the ingredients and put them on a bowl of rice. I used Brown Rice for healthier choice. 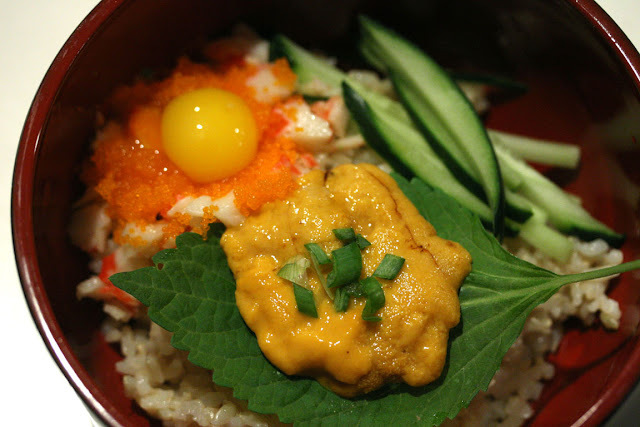 Uni (Sea Urchin), Sesame Leaf, Scallions, Chopped Crabmeat Mixed w/ Mayo & Chili Oil, Masago (Smelt Egg), Uzura (Quail Egg), Cucumber, and Brown Rice. 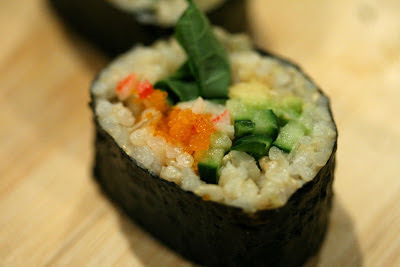 I used the same ingredients and added avocado to make the California Roll.